Full function radio control car includes 2 removable figures of Buzz and Woody. Battery Requirements: 5 x AA and 1 x 9V. Have hours of fun driving Buzz and Woody around in their remote control car. Steer with the steering wheel with this easy to use control. Go where ever you want to, having many adventures along the way. 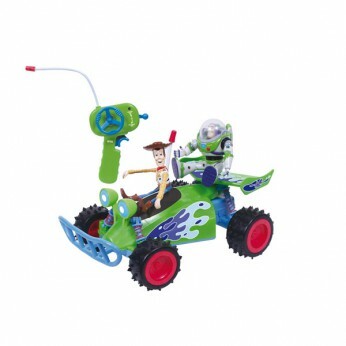 Comes with Buzz and Woody figures; Steer the car with the easy to use steering wheel. Size H23, W35, L25cm; Batteries required: 5 x AA (not included). For ages 3 years and over; EAN: 8421134140066. WARNING(S): Not suitable for children under 3 years old. Only for domestic use; To be used under the direct supervision of an adult. * . This toy costs approximately £29.99 (for the latest and best prices make sure you check our retailer list for the Toy Story Radio Controlled Car above). In our review of Toy Story Radio Controlled Car we classed it as being suitable for ages 3 years, 4 years, 5 years but recommend you check the manufacturer specific advice before purchasing.